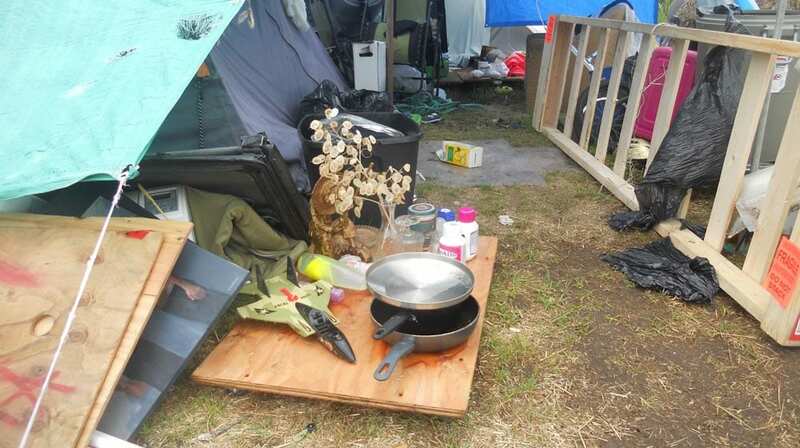 You are here: Home > Residents of tent city in B.C packing up, but where will they go? Residents of tent city in B.C packing up, but where will they go? 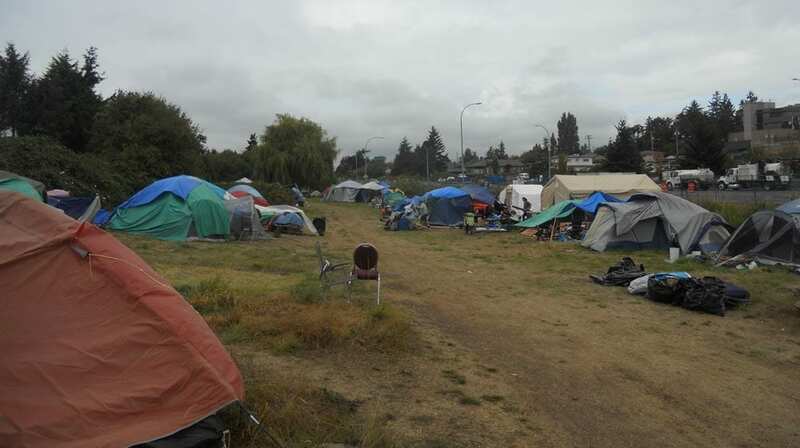 National News | September 12, 2018 by Kathleen Martens Attributed to: | Comments Off on Residents of tent city in B.C packing up, but where will they go? From the road it looks like a refugee camp. Nylon tents and makeshift shelters flatten the grass in Regina Park, where about 120 homeless people live in a small tent city in the District of Saanich. That’s a nod to the way settlers cleared Canada, says camp spokeswoman Chrissy Brett. 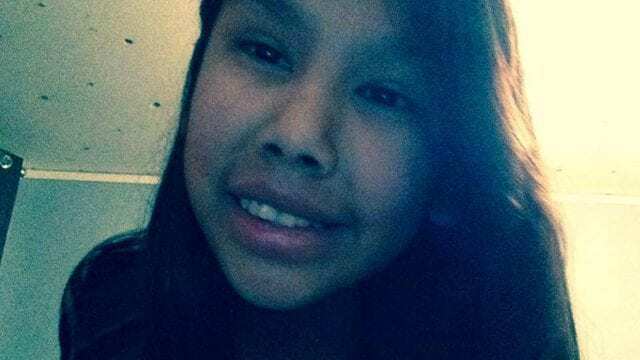 “Indigenous, homeless people face systemic, colonial, white-washed hate in displacement from governments, from municipalities, from the province and the federal government,” she says. 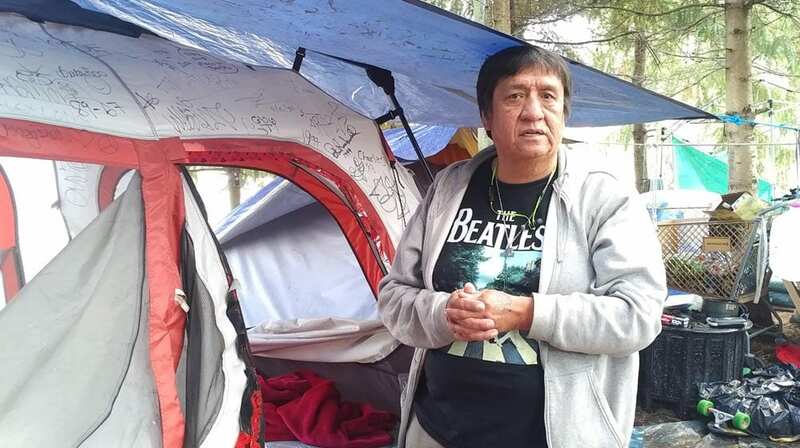 William Billie and his 19-year-old son, Trevor, are from the Nam’gis First Nation further north on Vancouver Island and live in a tent facing the busy road. They say people in passing cars shout insults at them. “One day I heard a person say, ‘Oh, look it. You Native people are making Victoria look bad’,” says Billie. “Some trucker drivers lay on the horn,” says Brett. Despite the problems the vibe remained upbeat Monday as they faced a court-ordered deadline to vacate the park by 7 p.m. Tuesday. Some people were busy packing up but others planned to defy the injunction. Brett says they were invited to shelter here on unceded Coast Salish territory. “We are trying to support people the government failed,” she says, reciting a litany of reasons people find themselves on the street. 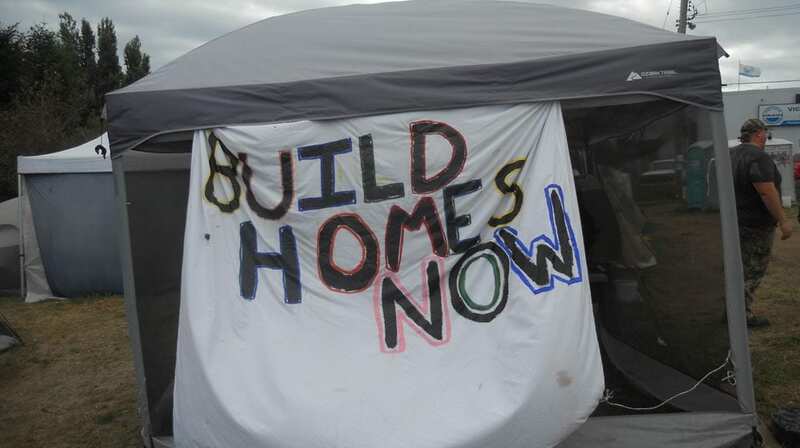 This camp is one of about half a dozen tent cities in B.C, where mortgages and rent are among the highest in Canada. Homeless people want the right to live legally in a park when housing isn’t available to them, says Brett. She says Camp Namegans gives people the freedom to leave and apply for services – even look for housing – while their tent and belongings are protected. It also gives people a chance to stay in one place and maybe dry out or come off drugs, she adds. 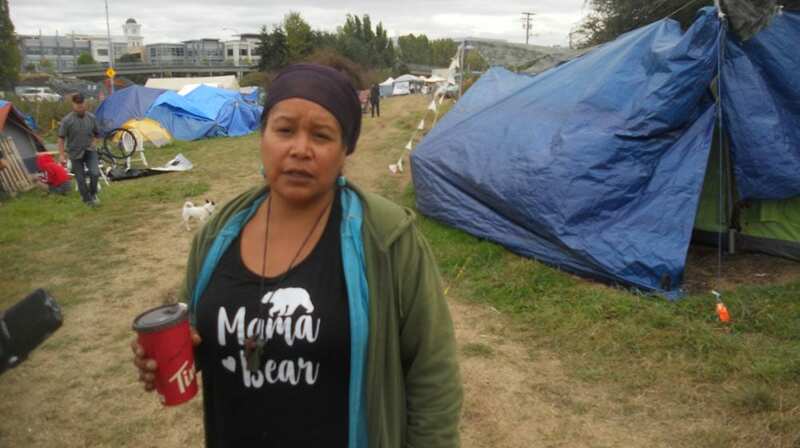 Brett, a Nuxalk woman and the camp founder, says contrary to what some politicians and police officers say the camp is violence and fatal-overdose free. “This is way safer than government-run programs that are out there because we treat people with humanity, kindness and compassion,” she says. Sgt. 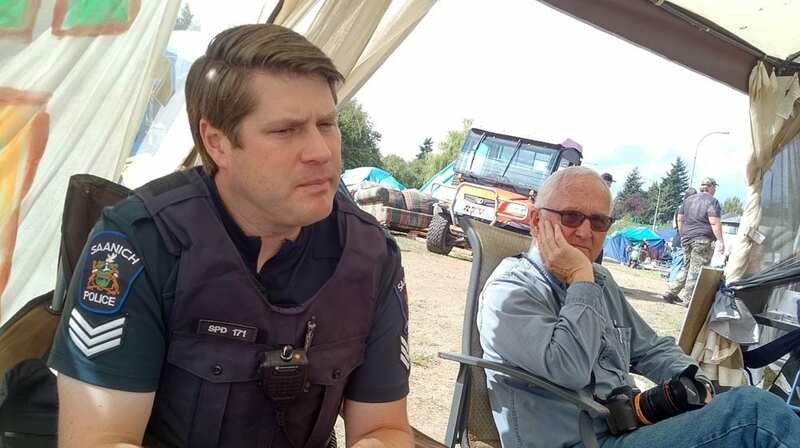 Andy Stuart, with the Saanich police community engagement division, has been coming regularly to check in with residents. “What’s happened in the past doesn’t fit very well with the current laws of Canada and municipal bylaws,” says Stuart. Brett says that shows how these camps are educating public officials about homelessness. Earlier this summer, Brett was charged with assault and obstruction of justice after blasting an air horn when firefighters were responding to an emergency in camp. She says she was using it as a teachable moment. Still, police say homeowners near the camp are reporting an increase in property crime. And the Saanich Police Service has identified a street gang member in camp they are concerned about. Brett says simply he is homeless like the rest of them. Billie says living in this tent city with his son has been a gift. “This has been like a home,” he says of his three months in the park where someone gave him a single mattress to sleep on. Workers with various social organizations could be seen in the park Monday trying to help. But Brett says employees with the big ones – municipal and provincial housing and social welfare agencies – don’t make house calls. 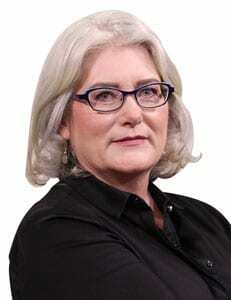 “Some of us refer to those organizations as ‘poverty pimps’ because their outreach services require people to go in to them if you want services,” she says.